Presenting the Burbank Noon Rotary Rex Andrews Scholarship to Det. Joshua Kendrick! 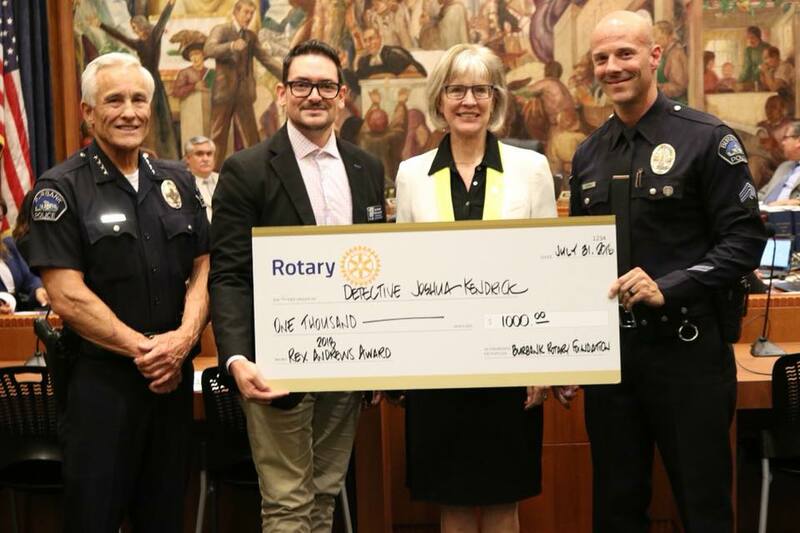 In August 2018, the Rotary Club of Burbank Noon awarded the annual Rex Andrews Scholarship to Detective Joshua Kendrick. Rex Andrews was the Police Chief in the 1950's to 1970's and a member of our Rotary Club. Since the 1990's we have presented this award to an employee from the Burbank Police Department. Mr. Andrews always emphasized the importance of furthering your education. This award was presented by Club President Albert Hernandez and Rotarian/Police Chief Scott LaChasse at a recent city council meeting. We congratulate you Det. Kendrick and wish you the best as you continue your education.